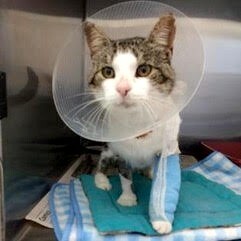 Bubba was found as a stray suffering from what appeared to be badly injured front legs. His “injuries” were actually multiple tumors requiring surgical removal. The post-surgery healing process involved many trips to the vet for bandage changes under sedation and weeks on pain medication and antibiotics.